Named after the fish that it was first identified in, neon tetra disease strikes members of the tetra family, but other popular families of aquarium fish are not immune. Cichlids such as angelfish and cyprinids such as rasboras and barbs also fall victim to the disease. Even the common goldfish can become infected. Interestingly enough, cardinal tetras are resistant to the ravages of neon tetra disease. What Is Neon Tetra Disease? 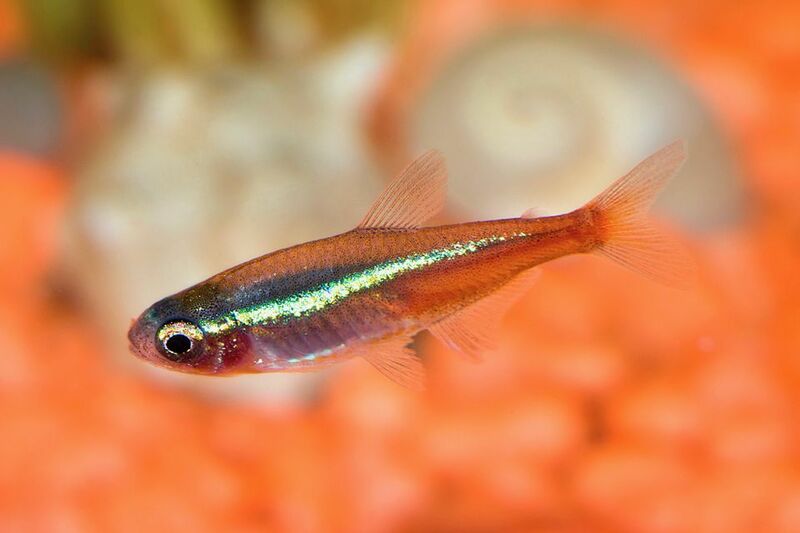 Neon tetra disease refers to a condition caused by parasites that's more common than many aquarium enthusiasts realize, and affects species beyond neon tetras. The disease is degenerative, meaning it starts out mild but then progresses quickly to become very severe. During the initial stages, the only symptom may be restlessness, particularly at night. Often the first thing an owner will notice is that the affected fish no longer school with the others—a clear sign that something is wrong. Eventually, swimming becomes more erratic, and it becomes quite obvious that the fish is not well. As the disease progresses, affected muscle tissue begins to turn white, generally starting within the color band and areas along the spine. As additional muscle tissue is affected, the pale coloration expands. Damage to the muscles can cause curvature or deformation of the spine, which may cause the fish to have difficulty in swimming. It is not unusual for the body of the fish to have a lumpy appearance as the cysts deform the muscles. Rotting of the fins, especially the caudal fin, is not uncommon. However, this is due to secondary infection rather than a direct result of the disease itself. Bloating is another secondary infection. Neon tetra disease is caused by a parasite called Pleistophora hyphessobryconis. It enters the fish through infected food and other material such the bodies of dead fish or live food, which may serve as intermediate hosts. Once inside a fish, the parasite will literally eat the fish from the inside out, starting with the digestive tract and stomach. Embryos hatch inside the intestines, burrow through the intestinal wall, and there they produce cysts. The cysts damage the tissue; signs of tissue damage include paler color and weaker muscles. It's important to know neon tetra disease is highly communicable, and can easily spread through a tank quickly. To save your fish, you will need to remove infected fish as early as possible. One of the slightly comforting aspects of this disease is that it is at least not transmittable to humans. There is no known cure for neon tetra disease; in fact, most fish found to have the disease are euthanized. To ensure all fish are not lost, remove diseased fish from the tank. Some species, such as angelfish, may live for quite some time with the disease, but they should not be allowed to do so in a community tank. They should be quickly separated from uninfected fish to avoid spreading the disease. The best prevention is to avoid purchasing sick fish and to maintain high water quality. In addition, it's important to remove sick fish from your community tank as soon as possible: there is no real cure for the disease, and more so, many fish will eat other dead fish when given the chance. When purchasing fish for your tank, select a well-regarded supplier. If buying online, be sure to check out any reviews and avoid buying for price versus quality. If possible, though, buy locally. This will give you a chance to carefully observe the suppliers fish. Do not purchase any fish from tanks where there are sick, dying, or dead fish present; you can usually identify a sick fish because it will not school with the others (assuming that the fish you're selecting are schooling fish). Once you've selected your new pets, quarantine new fish for two weeks before adding them to an existing community tank. This will give your fish a chance to adjust to a new temperature while also giving you an opportunity to observe their behavior and appearance. If you see any signs of sickness, get in touch with your supplier and avoid allowing questionable fish to interact with others. Maintain high water quality and select fish foods from a known and respected source. As with any fish or fish supplies, it's easy to wind up with contaminants even if you purchase high-quality fish food. The risk is greater, though, if you buy online at the lowest cost. Is Your Fish Omnivore, Herbivore or Carnivore? What Is the Best Fish Food for Tropical Fish? Is Your Betta Fish a Boy or a Girl?